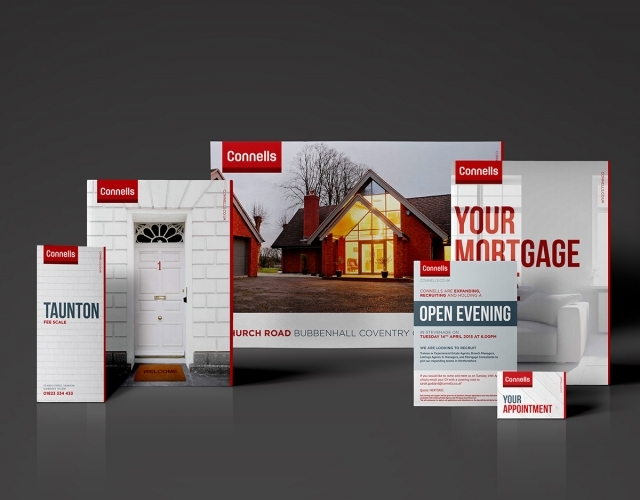 Rocket Creative has helped launch a Connells Residential revamp creating the corporate new look recently rolled out across the UK. Connells Residential, one of the UK’s largest and most successful estate agencies, is making all the right moves in the housing market by unveiling a major updated look. The Northampton-based creative agency Rocket was chosen as the innovative brains behind the refreshed look for Connells Residential. A new logo was just part of Rocket’s revitalised look for Connells Residential. The aim was to give the business a fresher, contemporary look whilst incorporating the integrity of the brand’s heritage. In a bid to inject some energy into the new look, Rocket recreated a re-energised logo with contemporary font, new captivating, colour palette and design details which is featured online across Connells’ website, social media and portals including Rightmove and Zoopla. Opening the door to attracting new customers was another key feature. This update resulted in, eye catching ‘For Sale’ / ‘To Let’ boards. The exteriors of Connells’ extensive network of nearly 160 nationwide branches also received the Rocket re-touch ensuring they stand out on any crowed high street. The interiors were re-worked in stylish shades of red, white and grey.